Now for my very favorite salad in the whole wide world (seriously, we eat this almost weekly) and the chocolate covered strawberries! Toss it all together and serve fresh! 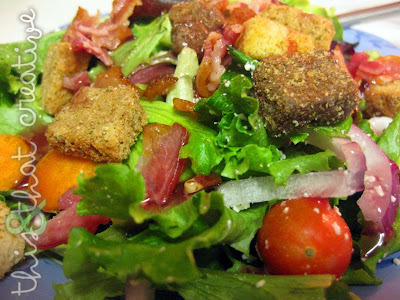 I like to use a blueberry pomegranate or balsamic dressing, but just about any type of dressing would be delicious. Obviously, you could omit any of the veggies you're not so fond of, or add some different ones if they're just sitting in your fridge. I got my chocolate-covered strawberry image and recipe from HERE. I won't lie. I'm pretty stoked to eat dinner on Valentine's Day. I love chocolate covered strawberries but I find them really hard to make. Mine always come out really flat at the bottom when the chocolate hardens...any suggestions?